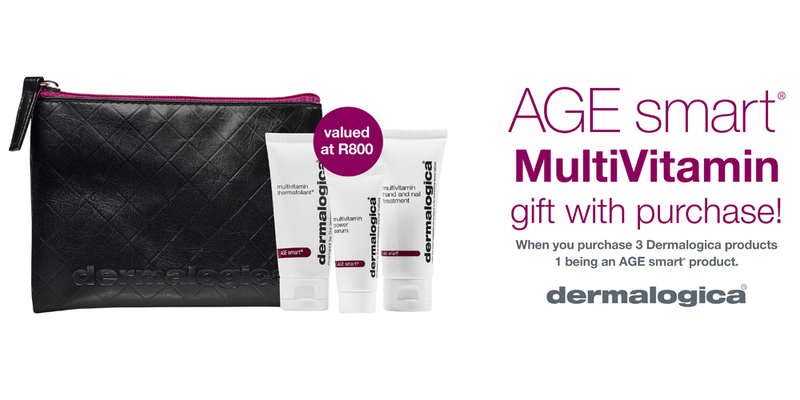 Purchase 3 Dermalogica products, one being an AGE Smart product and receive a Dermaogica Gift set which includes: Multivitamin Thermafoliant 15ml, Multivitamin Power Serum 7ml, Multivitamin Hand and Nail Treatment 15ml and a Multivitamin Power Firm Sample; all in a travel kit, valued at R800. Terms and Conditions Apply; This offer is valid from 01.05.2016 to 31.05.2016. Stocks are limited and may run out before the stipulated time period. This gift is non transferable for cash. Excludes the purchase of travel sizes and daily groomers.